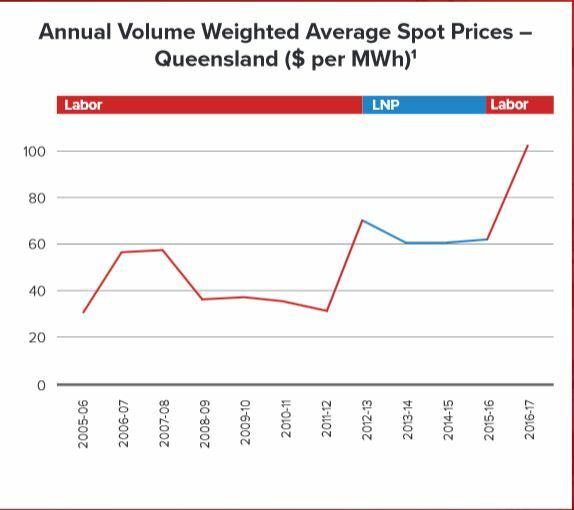 That’s 16.1%, see my post Cherry picking electricity prices in Qld election. These savings have all been locked in with the retailers in an Affordable Energy Pledge. The lazy media stopped listening when they heard about the $50 pa, which itself was about much more than 50%. 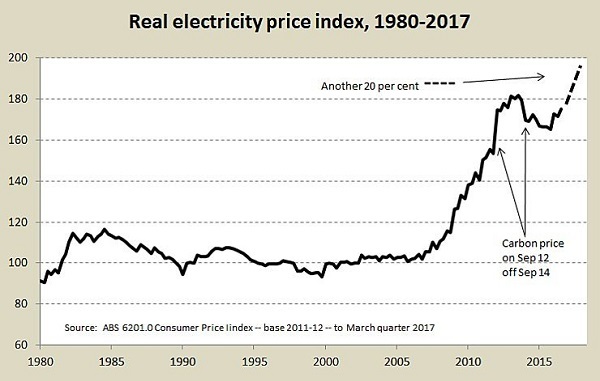 No-one seems to have read the media release of October 24 Stopping LNP electricity privatisation lowers electricity prices: study and the link to the Acil Allen report. In addition, Jim Soorley, who is on the CS Energy Board, told local radio that AGL and Origin were now matching the 25% discount offer by retailer Alinta. Soorley put this at about $350 on the average bill. I found that last fact interesting, because it puts the annual bill at around $1400. In the post Electricity bills – Queensland acts because it can I suggested that the ACCC had represented Queensland electricity bills incorrectly at $1955 to the tune of about $600 pa. According to the ACCC, and they are probably right, the price of the electricity from generators would represent around a quarter of the bill. There is a lot of difference between household electricity bills and electricity as a commodity. The graph in context gives a false impression of rising electricity bills. 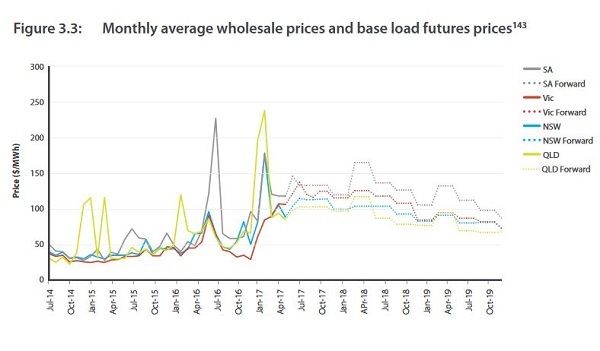 Prices peaked in Queensland in summer because Queensland was supplying electricity to New South Wales, which was supplying to Victoria and then on the South Australia while demand in Queensland with record hot weather exceeded expectations. Labor in Qld has taken a range of measures to prevent a repeat this coming summer. 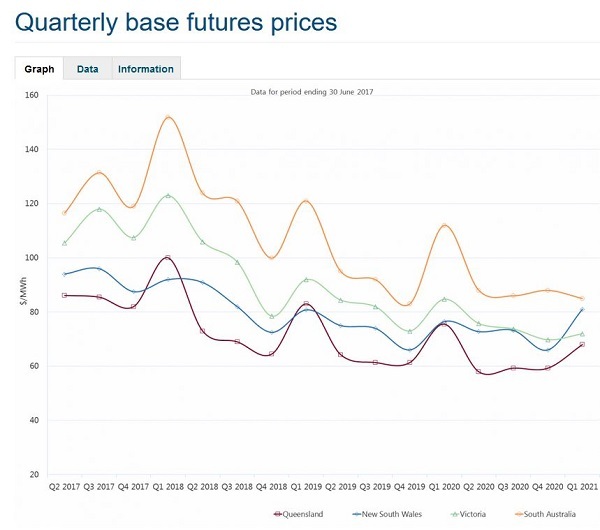 Note that Finkel saw Queensland prices as the cheapest in the future. Note that Queensland prices are the lowest in Q2 2017, and stay low. This is a worry for the LNP’s promised northern coal-fired power station which is only viable if prices stay above $75 MWh. The LNP claims that prices under Labor are at $103 MWh. The information in the report is clearly cherry-picked and unreliable. The second is facile, because prices have already reduced to well under $100 MWh. There are essentially four elements, so let’s look at them one by one. The LNP are proposing to return to 2011 when the state had three government-owned generators, as against two now – CS Energy and Stanwell. Between them they own 10 power stations with the re-opening of Swanbank E this summer, supplying about two-thirds of power within the NEM (National Electricity Market). Labor has spoken about establishing a third company to participate in the renewable energy market. Acil Allen found prices would drop by 8.3%, giving an average saving of $52 on electricity bills. I have my doubts, I think it is general free-market ideology rather than an examination of electricity generation. With electricity there is, I think, an issue of critical mass. Coal and gas stations have to be taken offline from time to time for maintenance, repair and upgrading. It is better to do this rationally within a fleet of generators. 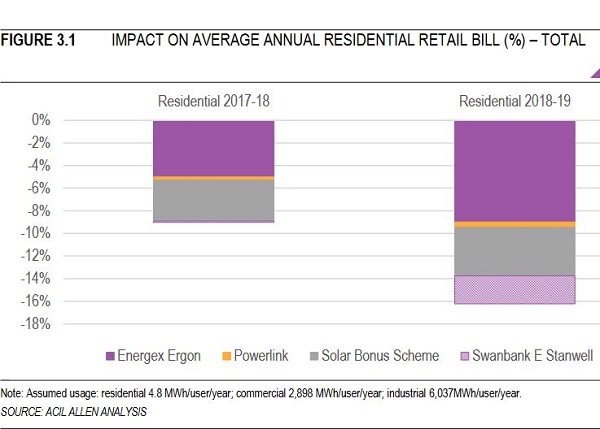 Also most electricity is supplied on longer term contracts to retailers. You have to be sure you can deliver. Also size allows deals like the Alinta price discounting, and allows CS Energy to write a contract to take all the energy produced by the solar/wind/battery Kennedy Energy Park development for 10 years, virtually underwriting the project. Small players can’t do those deals. The LNP proposes to write down the value of the electricity network (high voltage transmission and distribution polls and wires) by $2 billion, giving a saving of between $80 and $170 a year, every year between 2018-19 and 2020-21, that is, about 5% on the bill, and about 3% thereafter to 2030. This could only be done when these assets are owned by the states, as they are in Queensland. The ACCC puts the value of such assets in Queensland as over $25 billion. The NEM regulator AER determines the return on assets that can be charged, so reducing the value of those assets by over 8% would make a difference. How this translates into the electricity bill is another matter. The ACCC puts network costs in the average bill at $853 pa. Our bill in front of me puts the “supply charge” as $1 per day. If you add GST you get $410.50 pa, which at the end of the bill, is subject to a 14% discount. There is no way I can see that $1 per day stretching to $853. The ACCC puts networks at 50% of the Queensland bill. I think it is closer to 25%. The ACCC used retailers data, AER wholesale data and network tariff information. They did not verify this with a survey of actual bills as did the Thwaites Victorian inquiry. I now have four sources of information that put the average Queensland bill in the region of around $1350 to $1400 pa, not $1955 as claimed by the ACCC. The savings on bills may be half what the LNP claim. Modelling from the independent Energy Security Board shows adopting the NEG will save households an average of $110-$115 per year over the 2020-2030 period. This statement shows their true colours. The ESB proposal was delivered eight days after it was requested. Quite specifically, no modelling was undertaken. Giles Parkinson of RenewEconomy says the savings were not even a best guess, rather a figure cynically plucked from the air to sell the proposal. In any case, if there are savings they will accrue independently of any Queensland government action. Labor has instituted a policy of aiming for 50% renewables by 2030. I think this LNP policy means that they will no longer actively pursue any emissions target at all and will not put any state money towards developing renewable energy. A $200 pa saving on bills is claimed. In all probability at some time in the next 10 years politicians will realise that we simply can’t go on burning coal There is a real risk of even newish coal-fired plants becoming stranded assets. Leaving aside climate change, the LNP policy shows a complete ignorance of how the power system will change in the future. AEMO calculates that with more rooftop solar by 2035 the minimum daily draw on grid electricity will be around midday. Even then coal will have to compete with solar and wind with virtually zero marginal cost. A few hours later, as people turn on airconditioning and other appliances, the peak daily usage will be reached. Coal can’t cope with these variations and gas will be too expensive. From about 2025 renewable energy, firmed with batteries, pumped hydro, vats of molten salt, and backed by gas and demand response when all else fails, will produce flexible dispatchable power cheaper than coal and gas, whether existing or new. The information comes from AEMO. I photographed it from the dead tree AFR because I couldn’t find it on the net. It is the story of what happens now in South Australia when the wind blows in the winter. The Chile government says it will mean consumer prices fall by nearly 50 per cent once all the new projects are completed and online in 2024. The Chile record is expected to be beaten by Saudi Arabia in about no time flat. ‘Baseload’ chugging away at a more or less constant level 24/7 is a redundant concept, to be replaced by ‘dispatchable’. Politicians are finding it hard to get their heads around this change. My understanding is that the report cited by the LNP actually says that the station is only viable if it remains open for 30-40 years, there is no future price on carbon, and prices must stay above $75 MWh. The LNP plan says the station will bring prices down and cites the Minerals Council as its authority on comparative pricing. The LNP wants to allow regional consumers to access private retailers for cheaper prices. Currently Ergon sends out and collects the bills in regional Queensland. Residents get a uniform price, the same as the standard offer in SEQ. Regional users are subsidised by SEQ users to the tune of $600 million pa. I understand bills are cheaper by 30 to 140% as a result. I’ve hear $440 per average household quoted. Labor has offered regional consumers a $75 pa discount in return for monthly billing and automatic electronic debits. I say, let them be therewith content. The Thwaites inquiry in Victoria found that the cost of acquiring and retaining customers by private retailers exceeds the benefits accruing through competition. We’d likely save about 25% of the bill (the discount offered by Alinta) if we got rid of private retailers altogether. Much of this plan seems to have been written in May. Anything done by Labor since then has been ignored, which amounts to a good deal more than the LNP is offering. 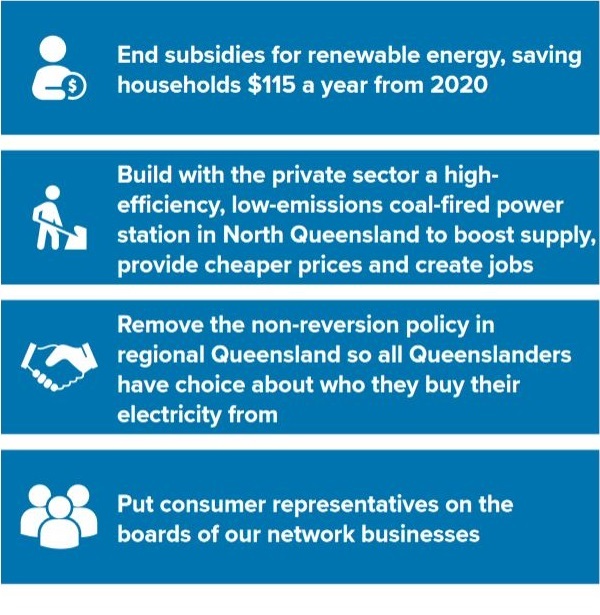 I think Palaszczuk wanted these changes to all show up on the electricity bill before an election next year. As the matter stands the last initiatives were announced a few days before the election was called. Most were poorly reported of missed entirely by the press. She should do a major back-announcement or the LNP will get away by seeming to do more while actually doing less. And leading us up a dry gully in terms of the future. Labor claims that bills went up 43% under the Newman government, and claim that under them they have gone up about 5% up to the time of the QCA pricing at the beginning of June. Since then Labor has taken action to reduce bills by 16% and more. I’d love to see someone with expertise in the industry do a full investigation as to the true picture, because I am at best a citizen journalist, a bit out of my usual patch in looking at this issue at all. Update: I meant to mention here, as I did in Cherry picking electricity prices in Qld election, that electricity expert Hugh Grant told Steve Austin on local ABC that Labor had taken $3 billion from the electricity system for general revenue compared with the LNP who had taken $5 billion. In my view this segment ended up being reprehensible for three reasons. First, there was much gawping at the $3 billion, and Austin ignored the fact that the take by the government had been reduced by $2 billion. He, and Grant, should have given the Labor government full credit for this. Presumably it was done to keep energy bills from rising. 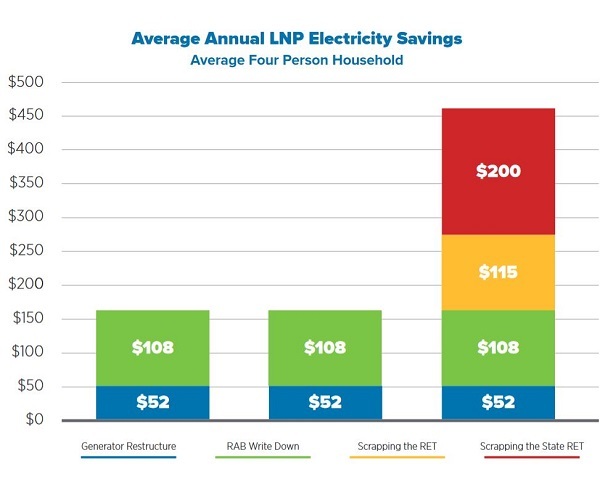 Secondly, as an expert, Grant had not seen the media release which came out two days earlier Stopping LNP electricity privatisation lowers electricity prices: study with a link to the study by Acil Allen showing that residential bills had to drop a further 16.1% to reflect savings initiatives taken by the Palaszczuk government in recent months. If I knew about it, then so should he. I understand that Austin may be too busy making a program to keep up with everything. Thirdly, no mention was made of the Paluszczuk government’s outstanding achievement in instituting a transition to renewable energy. I’m sorry to tell the ABC and Mr Grant, but climate change matters. 1. Queensland is leading Australia in large-scale renewable power projects. 2. New Queensland wind and solar projects are at significantly lower costs than new fossil fuel projects. 3. The Sunshine State’s solar households are national leaders, with 31.6% of households having solar rooftops. 4. Queensland’s energy system is one of the most secure and reliable in Australia. 5. Queensland’s energy system is one of the most secure and reliable in Australia. The renewable energy industry in Queensland currently provides 2,710 full time equivalent jobs across the state. It is estimated that reaching 50% renewable energy across Australia in 2030 would create over 6,000 jobs in Queensland. Jackie Trad, who is usually on top of her brief, said on local radio Drive that there was $5 billion worth of renewable energy projects under way, approved or in definite prospect. And if you go to this post and look at Item 3, you will find that Queensland is now second only to NSW in innovative startups with the very successful $420 million Advance Queensland fund, which, through the electricity network is going to give businesses in every town connected to the grid internet connectivity equivalent to the CBD in Brisbane. Why are we talking about a coal mine which is supported by both major parties, albeit in different ways, instead of news that Chief Entrepreneuer Steve Baxter described as important as bitumen roads to the development of the state? Tim Nicholls today (November 13) was saying that under Labor wholesale power prices have gone up by 70%. He was using his cherry-picked graph of spot prices, which form part of the wholesale price, but the larger part is made up of longer term contracts between retailers and suppliers. He was also deliberately confusing electricity prices and electricity bills. The man surely knows what he’s doing, and if he does he’s a shyster. If he doesn’t he’s a goose. 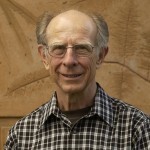 He was also saying that spending on renewables was a waste of money, and suggested it was putting up electricity bills. I don’t think the money spent on renewables was being paid by electricity consumers, but minister Mark Bailey won’t say how much is being spent because it’s commercial in confidence. It would help, however, if he excluded household electricity bills. Mr Bailey told a solar conference in Brisbane on Thursday there were another four large-scale renewables projects committed for Queensland, which would take the total to 22 with a total capacity of 1900 megawatts. He predicted the projects will deliver $3.7 billion in investment and 3000 jobs. The LNP has vowed to scrap the 50 per cent renewable energy target and back the building of a coal-fired power station in North Queensland if it wins office on November 25. On a trip to the Clare solar farm in North Queensland on Sunday, Ms Palaszczuk and Mr Bailey said a re-elected Labor government would invest another $150 million in clean energy projects including $97 million to put solar panels on schools, a $50 million downpayment for a new solar thermal power plant, $3.6 million to help decarbonise remote communities and a $1 million study for renewable solutions for the Daintree. They also reaffirmed their commitment to establish a new state-owned CleanCo with a mandate to deliver 1000 megawatts of renewable energy with a focus on flexible dispatchable generation. Voters have a choice. Tonight ReachTEL asked me about Adani, electricity and all. I’ll be interested in what they find. Chile @ $28 per MW=2.8 cents per kWh. Brian: It is all a bit complicated for a mere mortal to pick through let alone someone who is being seriously hurt by power price increases. Even worse with cunning pollies playing games with definitions of bills etc. “Savings” subsidized by taxpayers are simply shuffling charges and taxes around or a justification for cutting other services. Perhaps the thing that would really reduce bills would be a government owned retailer. It is the retailer and network rip-off that is really hurting. Demand management that shuts down some users for some time during peak demand periods would also make a difference. Peak demand determines what capacity the state has to pay for which in turn determines what the bill will be. (The poor are subsidizing McMansion air conditioning. 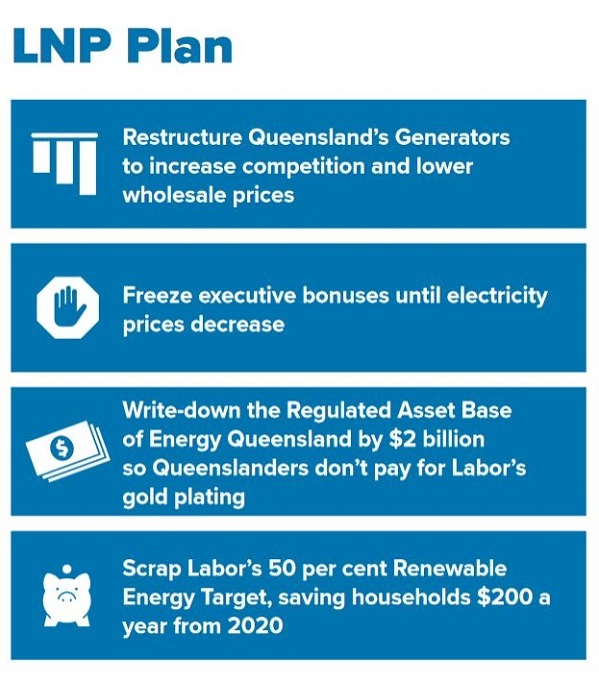 I think the approach here is to look at the outcomes from promises of Campbell Newman. LNP are good at baiting the public with mirages as did Can Do. Look at what Can Do actually did, and I don’t think that this list is complete. Apart from that the LNP are also masters of delivery failure, usually written down with “well we didn’t realise that the situation was so bad” like statements. That is a scary list Bilb. You wonder how much of this a new LNP government would do if elected? It sure is, and if asked he would claim that Queenslanders voted for all of that!! BilB, that is truly mind-boggling. Unfortunately it has the ring of truth about it. I meant to mention, as I did in an earlier post, that the Labor govt was taking $3 billion from the electricity sector to fund general revenue, according to Hugh Grant, compared to $5 billion taken by the LNP. I think that is how they kept bills down in 2015, 2016 and 2017. I believe that on top of that they have now reduced bills by a further $50 and then $16.1%, still to flow through to the actual bills. John, retailers are leaches on the system. Ergon does the job in the regions, why not Energex in SEQ. I believe it costs about 7% but they are charging about 30%. People could still be offered a variety of tariffs. The networks are certainly the cream for the government. Soorley reckons the generators have only been profitable in the last couple of years. In other states, except Tasmania, I think, just as much money is made, but it all goes to private enterprise. Energy bills for industry is a different subject. Some were on 5-year contracts or more and when they came to renew, got a rude surprise. I’ve added a long update to the post and a list of the earlier posts. I’m hoping now to let Steve Austin know it’s there and try to find Hugh Grant for comment. I meant to mention here, as I did in Cherry picking electricity prices in Qld election, that electricity expert Hugh Grant told Steve Austin on local ABC that Labor had taken $3 billion from the electricity system for general revenue compared with the LNP who had taken $5 billion. In my view this segment ended up being reprehensible for three reasons. Your command of detail and investigating skills are superb. This really is a new era of “citizen journalism”. Hitherto I had been somewhat sceptical of the hype, though Larvatus was a very fine forum. Now your example convinces me. Three cheers!! Mr Grant said the AER was allowing Powerlink rates of return more than 20 times that of the construction sector, 10 times that of the resources and banking sectors and 3.6 times supermarket operator Woolworths. I’ve actually got no idea what he is talking about, but I think it is return on assets. It’s not at all helpful to make comparisons across industries. For a bank, for example, loans are the major part of their assets, on which they make an interest spread of 2%, but I think a little more than half of that goes on costs. Yet the banks are accused of ripping people off and making humungous profits. The other common measure is return on equity, which is the return on the market value of the company as reflected in the share price. Our family has three direct investment portfolios with I thing at last count 29 stocks in total. I don’t actually regard either of those measures as particularly important. They are often quite misleading as to what is going on in the company. Last I looked they would have you buying Woolies hands down over Commonwealth Bank. We’ve just sold Woolies. So I’d really be astonished if Grant was making an argument that was worth a can of beans. Thanks, Ambi, I think your bloke Andrews is cooking up a storm on renewables, but I haven’t had time to follow it in detail. Tim Nicholls today was saying that under Labor wholesale power prices have gone up by 70%. Thanks for that last item, Brian. That is the Labour I prefer. Solar panels on schools, great plan! And 1.9 gigawatts of new renewables capacity. Brilliant! Solar panels on schools and other prominent public buildings become talking points , not in the political spouting sense, and help keep the momentum up. It’s a bit like a fruit and vegetable market, but the only products for sale here are electrons. But remember — we’re buying and selling electrons, not apples here. And the way pricing in this market works is a little strange. Power is dispatched by the market operator in order of price from lowest to highest. Let’s return to our fruit and vegetable analogy: let’s pretend you need to buy 100 apples. One wholesaler might be willing to sell you 99 apples at 10 cents each. But you still need one more apple. If the next most expensive wholesaler is offering his apples at $10 each, you will have to pay $10 for each and every one of those apples! Markets done well can be useful but our electricity spot market system is a recipe for rip-offs of the consumers. If that is true, John D, I am gobsmacked. It sounds like SA has a huge need for a publicly owned power generator. If the market gets too greedy then that is when the public should act in its own interests. Now you are going to tell that that is just what they are doing…I hope. Get Mr J to explain how much better it would work, if SA bought only the blue electrons. Everyone knows they’re cheaper. And they have a longer shelf life, too. Only a government could invent such a hopelessly convoluted and dismally dysfunctional mess and label it a ” market “. The sooner we’re all off grid the better, and that will happen one day. Jumpy: It was not my side of politics that fell in love with privatization. Jeff Kennett lead the way with claims it would reduce power prices. John, I think the problem with wind that doesn’t have storage is that generators can’t write longer term contracts, so they tend to get relegated to the spot market, which I suspect is a larger part of the market in SA than elsewhere. Part of the problem has been that the spot market can cause havoc for the fossils, especially coal, because wind can undercut them. They allowable price actually goes down to -$1,000, from memory. I think there is something in the notion that the last coal station in Port Augusta was closed down earlier than it might have been (albeit it was poisoning the town) because of wind. I think they bid for half an hour’s supply, adjust and reprice every 5 minutes, then the prices are averaged across the half hour, and everyone gets paid that price. I put it in a post somewhere, so that’s from memory. Then the spot market sits on top of the longer term market, which has commonly been called baseload. Also I don’t know whether all that stuff about frequency and voltage variation is valid. It didn’t ever bugger up the system before the blackout, and they’ve only been talking about it since then. I’ve long thought, there doesn’t seem to be any unbiassed commentator on electricity prices with the necessary expertise. Bruce Mountain might come close. I’d also caution about quoting the ACCC report on bills. I think they have them about 40% higher than they should be for Qld. They didn’t survey actual bills. Other than that I’m becoming more and more convinced that competition between private operators doesn’t work in the electricity system. Having about two or three large privately owned operators is probably the worst of all possible worlds, even worse than a private monopoly under regulation. Hi Mr J at 4.16pm, it is a type of market. There are investors, wholesale producers, retailers, distributors, buyers, advertisers, and a regulator. Just because it’s dysfunctional, doesn’t rule it out as a “market”. Perhaps you are thinking of the Ideal Market, a la Plato, which delivers efficiently, cheaply, with good returns on investment, minimal regulation; and everyone lives happily ever after. Has that ideal ever been realised?? Some markets work reasonably well, others go bl**dy haywire, is my view, Mr J. Just as, on the other side, so many experiments claiming to be “socialist” have finished up with dominating elites, misery, stagnation, injustice and murder. Please investigate the terms “monopoly”, “duopoly”, “cartel”, “anti-trust”, and “Trade Practices”. I have investigated Mao, Stalin, Pol Pot, Lenin, Castro and Guevara; Allende. Haven’t yet read much about France 1789, Cromwell, Hitler, or your despised Hugo Chavez. BTW, off grid will be very good for some; perhaps not so for the poor or tenants. Now there’s a practical project: how to increase solar PV installation on rental houses!! Here’s an article which gives a more positive account of how the market is working in SA. 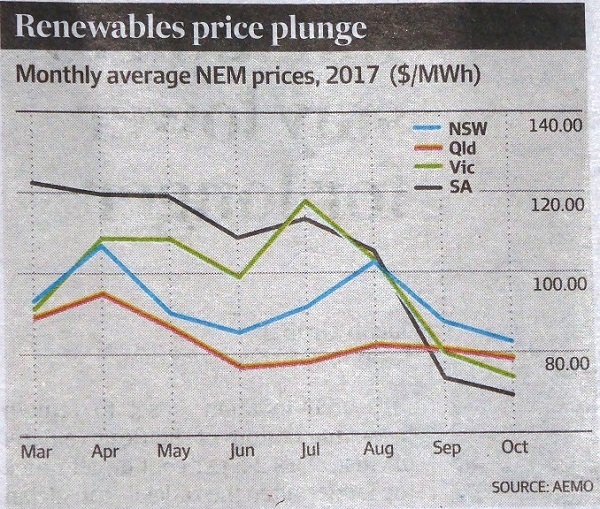 I’ll also remind folks that there is a graph in the post showing that NEM prices in SA were lower than in Victoria, NSW and Qld in September and October. More generally, in addition to what I was saying in the earlier comment, in Qld, where we have two government-owned retailers with around 70% of the market, CS Energy has signed to take the power from Kennedy Energy Park for 10 years. I presume this means that CS Energy will buy the renewable power at an agreed price, and sell it on the market. It means CS Energy takes the risk. CS Energy, as far as I can see, only has coal, no gas, but may have contractual arrangements with gas operators to back up the renewables. My argument is that larger generators can have the flexibility to integrate renewables. The LNP has promised to split Qld govt generators into three to promote competition. Bad and unnecessary move IMO.